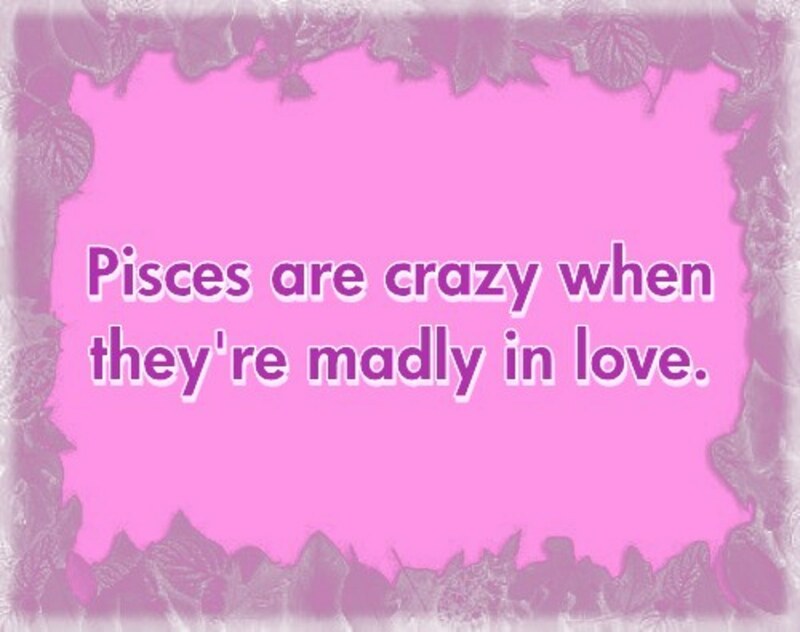 Each person is said to have a specific Zodiac symbol(also known as Sun sign. ), based on the month he/she is born in. Further these symbols are used to determine our life conditions, possibilities of favor of luck in the particular fields, for particular duration as predicted by Astrologers studying the position of various stars moon etc., via their own astrological science. "Rahu- Ketu ki dasha, mangal shani ke grah me pravesh kar gya hai, 5100 ki pooja karani hogi.. Sitare viprit disha me pravesh kar rhe hn, bhagya..... yagya-anushthan karwane honge, 51000 ka chadawa lgega..."
Translate - Rahu-ketu's Impact, mars entering the zone of saturn, Rupees 5100 needed for worship, for well-being. Stars moving in directions opposite to fate... Yajnas are needed t recover fate, an amount of 51000 is needed to be devoted. Oh Cool Presto! Astrology says it can predict our future, our lives and many of our personal data, all what is just a fiction for our recent material science, it says to performs something what our material science actually doesn't yet shows any possibility of happening. But its also equally true that - Astrology is a very historic and long time subject, believed and trusted by many so we can't directly deny or question over its truth. But well its also exactly true that as we have adulteration common in every food type, the fake astrologers do exist in our society, who just run their business of astrology for monetary causes, using the dialogues of profound all time astronomers, and it is also estimated that fake astrologers outnumber the original ones. These are the constellations lying on celestial sphere, which are eclipsed by sun moving on ecliptic orbit, at the time of birth. If din't understood this astronomical language, Don't worry. Next we'll try understand it in brief detail. 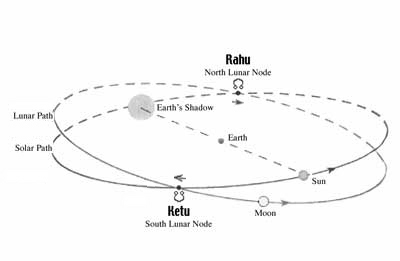 Actually, Rahu and Ketu are the astronomical points in the sky respectively called the north and south lunar nodes. But as we well know that our astronomy owns deep historic stories, especially many from greek and Indian mythologies. As per the Indian mythology Rahu and Ketu were two Asuras(Demons), who accidentally dranked Amritā(the immortality nectar, Greek "ambrosia") obtained from samudra manthan(churning of the ocean). According to hindu mythology devas and Asuras were two rivalry groups. Devas are believed to be practicing the principals of truth, justice, faith,wisdom and believe in civilization, happiness,beauty, aesthetics and everything like, which are parts of preaching of saints(but offcourse less of non-violence.). Asuras were considered to be of demonic nature, with lesser of wisdom, and high believers of physical power and strength, they were believed to lead a life of no rules and controlled by their state of demands and needs. They are said to believe in destruction, were highly violent, and cruel. Lord Indra, the King of Devas, while riding on an elephant, came across a sage named Durvasa who offered him a special garland. Lord Indra accepted the garland, placing it on the trunk of the elephant as a test to prove that he was not an egoistic God. The elephant, knowing that Lord Indra had no control over his own ego, threw the garland to the ground. This enraged the sage, as the garland was a dwelling of Sri (fortune) and was to be treated as respected. Durvasa Muni cursed Lord Indra and all devas to be deprived of all strength, energy, and fortune. In battles that followed this incident, Devas were defeated and Asuras (demons) led by king Bali gained control of the universe. Devas sought help from God Vishnu who advised them to treat asuras in a diplomatic manner. Devas formed an alliance with asuras to jointly churn the ocean for the nectar of immortality and to share it among them. However, Lord Vishnu told Devas that He would arrange that they alone obtain the nectar. 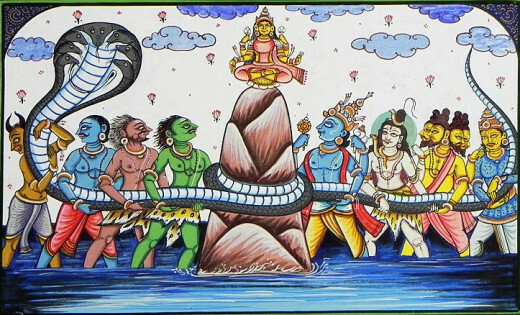 Mount Mandaranchala, also known as Mount Meru, was used as the churning rod, and Vasuki, the king of serpants, became the churning rope. The Samudra Manthan process released a number of things from the Milk Ocean, the lethal poison known as Halahala, many precious gems, Goddess of fortune, apsaras(The beautiful feminines, now termed to symbolize feminine beauty), supernatural animals etc., along with nectar of immortality. As Amrita was obtained, duos started a fight for amrita, both the teams-devatas and asuras were trying to get hold of it. Than, lord Vishnu, through his magical powers transformed himself to mohini(A beautiful Apsara), and entered the throne for distributing the Amrita among the two, mohini distracted Asuras with her dance and presentations and kept distributing all the nectar among Devatas, but an Asura named RahuKetu got hold of the situation and cleverly disguised himself as deva, and managed to obtain some Amrita. Due to their luminous nature, the sun god Surya and the moon god Chandra noticed the switching of sides. They informed Lord Vishnu in face of Mohini. and before the nectar could pass Rahuketu's throat, Lord Vishnu tried cut off his head with his divine discus, the 'Sudarshana Chakra'. But as some nectar had gone down his throat so he did not die. From that day, his head had been called Rahu and the body as ketu, who became planets later. Our solar system lies in the milky way Galaxy, it comprises of nine planets and five defined dwarf planets, with their own set of moons, or a single or no moon for some, asteroid belts, comets etc.. As shown in figure. Note - Moon, is actually a noun as the name of Earth's natural satellite, but it is also generally used to term the natural satellite of any planets. At the center of solar system lies the sun, with eight planetary orbits, starting from Mercury, than Venus, Mars, Jupiter, Saturn, Uranus and Neptune than Dwarf planet Pluto... Between Mars and Jupiter lie Kuiper belt which contains many small rocky bodies of sizes much smaller than those of planets and of undefined shapes, termed as 'Asteroids'. 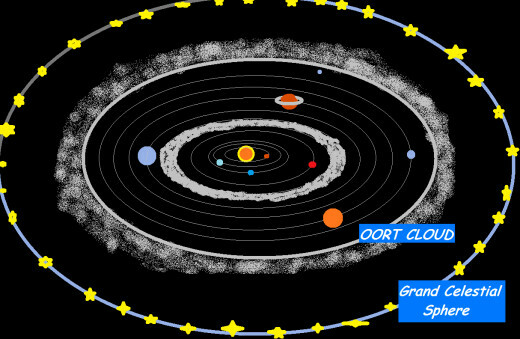 Beyond Neptune and Pluto, we have, an spherical envelop termed as Oort cloud, where we have the 'Comets', the Celestial objects made up of ice, gas and dust. And many miles beyond these belts starts existence of many other stars in the sky, at varying distance from sun. Since, these stars are at very large distance from earth, they are visualized to be projected in a Celestial plane, which is observed as a sphere, due to spherical shape of earth. And from here comes the concept of Celestial sphere. 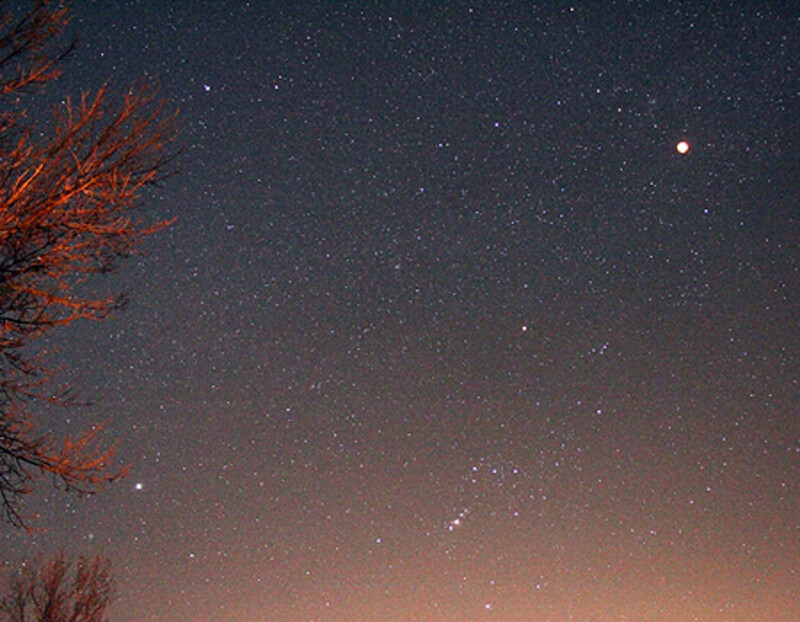 From any point of earth only half of the celestial sphere is visible in the sky, the portion lying above the viewers Horizon, as in figure 4. The Celestial sphere shown in two dimensional plane. This is how a horizontally sliced portion of our solar system and celestial sphere would look like, in approximated plane of sun and planets. The twelve Zodiac symbols are actually the 12 twelve different patterns of stars which are observed on the celestial sphere, from our earth. In 1933, the International Astronomical Union specified a definitive set of 88 constellations. Amongst'em the twelve most well known are Zodiacal constellations that lie along the ecliptic(*). Constellation is group or specific pattern of stars as observed on celestial sphere from on the earth. They are also helpful in identifying a region in the sky. The individual stars within a constellation have no physical relationship as they are at varying distance from earth. But since they all are at a very far distance from earth, their projection together on the celestial sphere form a specific pattern. 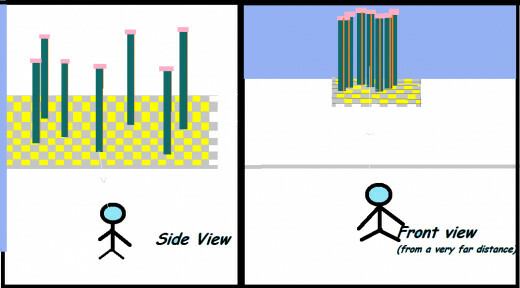 As here in figure we can analyse how the objects at varying distance can be considered projected in a single two dimensional plane as observed from very far distance. Zodiac sign vs. Period of Birth (J2000 Coordinate). Earth revolves around the sun in an ecliptic orbit, but if we consider earth as fixed at its position, i.e. we observe the sun from earth,it would appear as the sun performs an apparent ecliptic motion around the earth. Now, here on being an observer from earth, we'll consider the Sun as revolving around earth. Revolution axis of sun doesn't coincides with the projection of earth's equator on celestial sphere. i.e. Sun is not always atop at equator of earth, Sometimes it is aboveand sometimes below the equator. It revolves at an orbit going a maximum 231/20 either above or below equator, as in figure below. 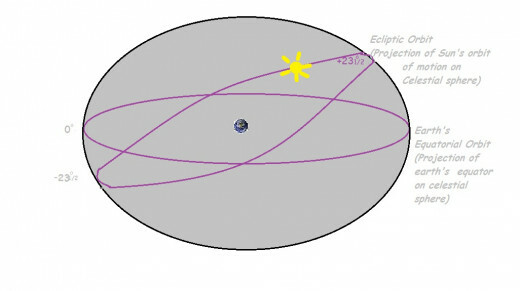 This orbit of revolution of sun which is at an orientation of 231/2 degree from equator is the orbit of apparent motion of sun around earth, known as ecliptic orbit. Why this orbit is known as ecliptic orbit ?? stand at a position from where we can see the sun, it's day time in our direction. While, in opposite part of earth it is night from where we can directly observe the sky(Celestial sphere). Out of 12 famous Zodiacal symbols, one always lies right behind the sun, which we cannot observe from earth. i.e. 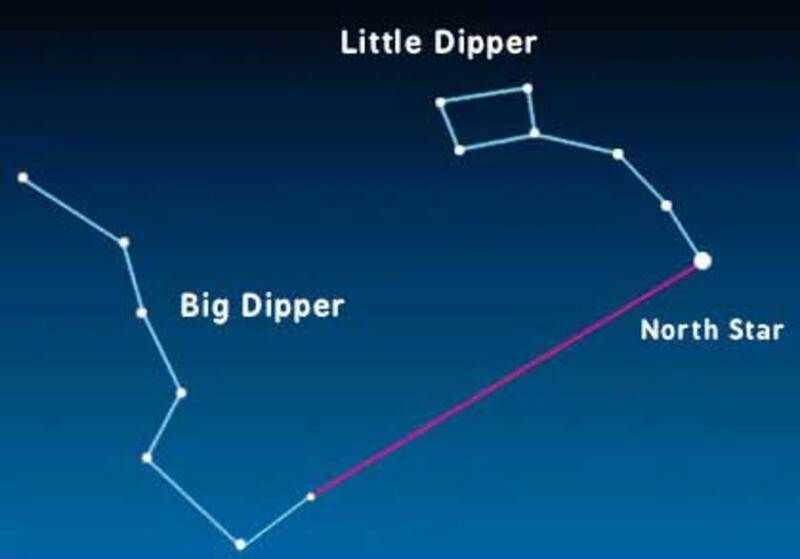 this particular constellation is eclipsed by the sun. 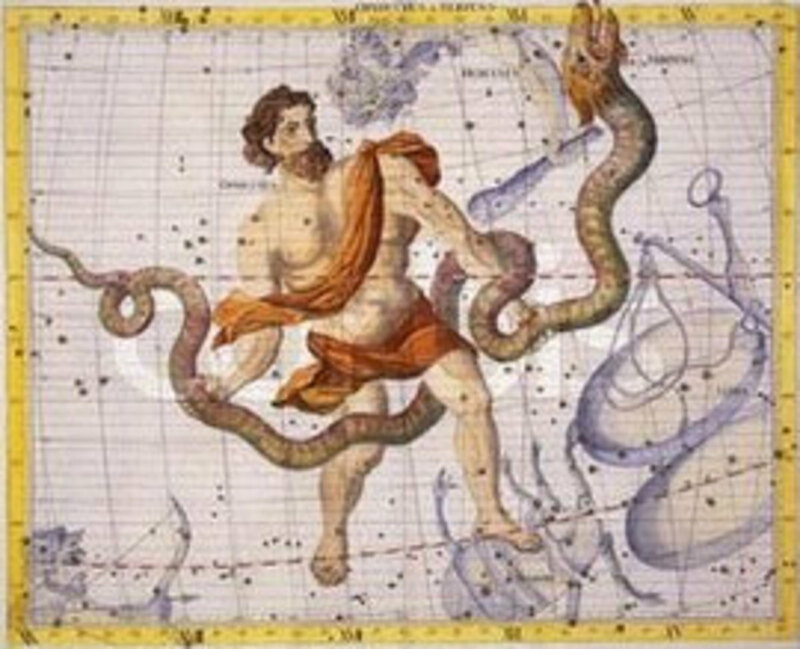 The constellation which is eclipsed at the time of birth of a person is considered as the sun sign or zodiac sign of that person, for lifelong. It takes almost 30 days for sun to completely pass through each constellation, i.e. about a month. The table shows the zodiac symbol as per the day and month of birth, according to J2000 coordinates. ?? What is J2000 coordinate. Our Coordinates shift with time. sunsign is LEO. Why So ? 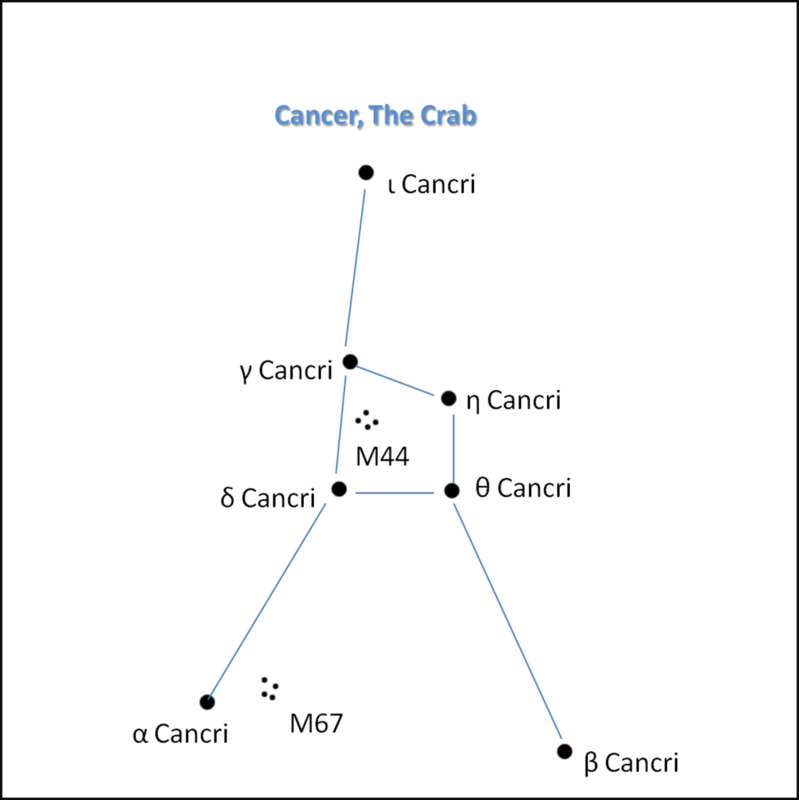 As we can see J200 coordinate table shows that my mother's zodiac symbol was also suppposed to be Cancer, but at her time of birth sun was in between Constellation Leo and Earth. There is a reason for it.. it is the way our calendars are designed, our sidereal time is calculated by time taken by earth to rotate by 360 degree, considered as 24 hours. While due t o its revolution motion on orbit, it takes 4 extra minutes per day to visualise the sun at initial position. specify position of celestial objects in sky) shifts 1 degree per day. This specifies annual change in pattern of sky. Leo on July 17th, but now it eclipses Constellation Cancer on this day. 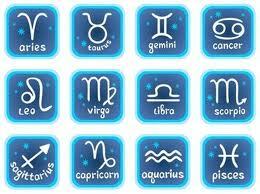 date and month but also year and time to tell our Zodiacal symbols. Interested in subject!! and want to know more!! we can always go for some good books. B.W. Carroll & DA Ostlie, An Introduction to Modern Astrophysics. These would be great to explore your sky and learn more about our universe. 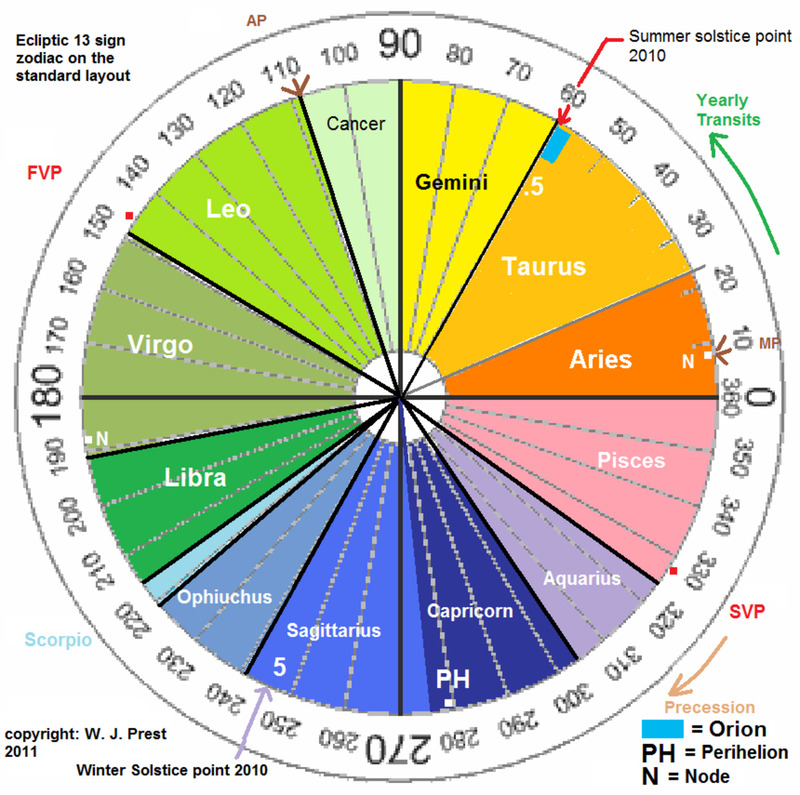 Zodiac as Matchmaker: Is it Really "Written in the Stars?"